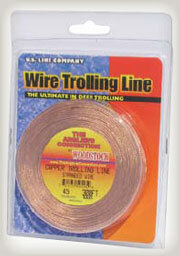 Copper trolling wire has quickly become a top seller for deep water presentations. Woodstock’s copper wire gives the angler an opportunity to fish a higher quality, tighter braided wire at a lower cost. Copper sinks about 10% deeper than traditional trolling wires and leadcore.